According to a recent study by the University of Basel, the European Commission's Joint Research Centre and the Centre for Ecology & Hydrology, almost 36 billion tons of soil is eroded every year due to water (mostly rainfall), while deforestation and other changes in land use make the problem worse. The study, published in the journal Nature Communications last month, also offers ideas on how agriculture can change to become a part of the solution rather than being part of the problem. The research findings, "An assessment of the global impact of 21st century land use change on soil erosion", offer an unprecedentedly thorough, high resolution assessment of global soil erosion. Dr David Robinson, who is a soil scientist at the Centre for Ecology & Hydrology, was a co-author on the research. He said, "This work is unique in attempting to quantify how land use change is impacting soil erosion processes globally, and in seeing how erosion potential is linked to national wealth." The study quantified the effects of land use change between 2001 and 2012 and found that during this period, 35.9 billion tonnes of soil had been displaced due to water (mostly via rainfall) annually. According to our colleagues at the European Commission's Joint Research Centre, this is the equivalent of the weight of concrete it would take to build 250 of the world's largest dams, the Three Gorges Dam in China. The findings indicate a potential overall increase in global soil erosion driven by cropland expansion. 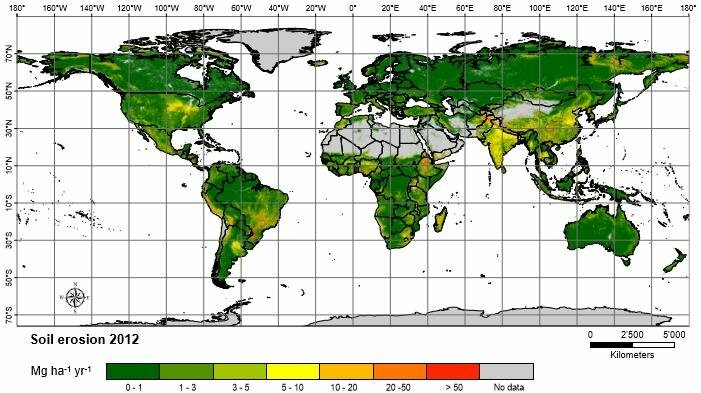 The greatest increase in soil loss is estimated for Sub-Saharan Africa, South America and Southeast Asia. This means that countries with less developed economies are estimated to have experienced the highest soil erosion rates. "...countries with less developed economies are estimated to have experienced the highest soil erosion rates." Soil loss increased by 2.5% between 2000 and 2012 mainly due to clearing forests for agricultural purposes. Soil erosion can be reduced however if soil conservation practices are adopted in agriculture. The study estimates that, if applied correctly, conservation practices could save over a billion tonnes of soil per year. Conservation agriculture currently covers about 15.3% of the observed cropland globally, reducing soil erosion by an estimated 7%. You can read the open access study here.